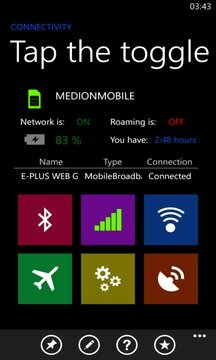 I am thrilled to present the new Connectivity App with over than 200.000 downloads. 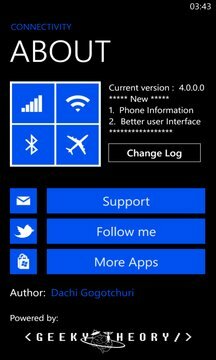 It has been restarted from scratch and done for Windows Phone 8. Connectivity has changed in this new version. It is better, faster and more powerful but it is still simple to use. This are the most important features for this application. With Connectivity, you can turn WiFi, 3G, Bluetooth and Plane On/Off on the fastest way ever seen. It's very simple and efficient, why it is so fast. Qualities: fast, simple, elegant and efficient!